What’s a bridesmaid to do? 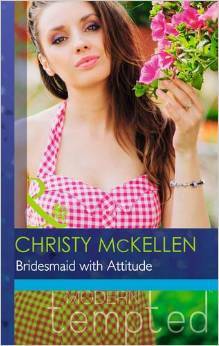 Emily Applegate is furious when Lord Berkeley pulls the plug on the venue for her best friend’s wedding. As head bridesmaid, clearly it’s her duty to give the killjoy a piece of her mind. But Theo Berkeley turns out to have good reason for his decision – and what’s more, he’s the hottest guy Emily’s ever seen! Brooding Theo is adamant that the wedding won’t happen at his estate… unless Emily and Theo can make a deal. Theo needs a favour, but is Emily willing to trade a wedding day for a role as the Earl’s fake fiancée? Especially when there’s nothing fake about the sizzle between them… !